ZoomInfo has updated its business and people search engine. For those unfamiliar with the service, ZoomInfo searches and provides information on 35 million ‘people’ and 3.4 million companies. Unlike most conventional company and people directories, though, the information is gathered and compiled automatically by what it calls a semantic search engine. Content can be edited and corrected by the subject themselves, but you have to pay for at least a trial subscription in order to do it. ZoomInfo is free for basic information and advertiser supported. For full access you can upgrade to a ZoomExec account for USD 99 a month, and the full PowerSearch option costs from USD 3,950/year. I have been attempting to carry out a proper evaluation for some time on behalf of various clients, and the redesigned site encouraged me to pay for a week’s trial at USD 19.99 for the ZoomExec service. I should make it clear right now, that I started this evaluation with a totally negative opinion of the service. My previous experiences of ZoomInfo in terms of quality have not been good and I regret to have to say that the upgrade has not changed my opinion. 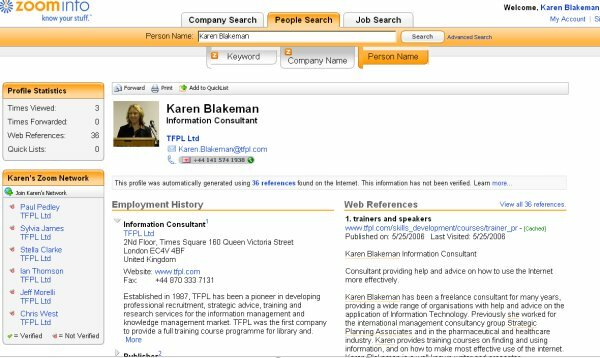 The home page features three tabs – company searches, people searches and job searches via content from Indeed. There is also a tag cloud representing popular keywords used in searches on ZoomInfo. Company search and people searches by name are ad-supported: searches by keywords, job titles and other criteria are part of the priced services. One always starts an evaluation such as this using standard test searches on something or someone you know. Inevitably, then, I first did a search on myself. It found 22 people, or rather profiles. These profiles are compiled from web pages found by ZoomInfo and grouped together. Some of the profiles refer to the same person (there were four for me when I looked) but it is amazing how wrong ZoomInfo can be and that it can miss so much relevant and correct information that is out on the web. If you have an account, you can set up your own public profile and consolidate existing profiles and correct them. Companies can do the same. That does not mean that the information will be any more accurate. ZoomInfo clearly states that it does not verify such information. For company profiles, you are supposed to be able to view a list of competitors. Not a single one of my competitors were listed. Instead I was presented with a list consisting mostly of search tools: Lycos, Infoseek, Northern Light, EEVL, News Now and so on. I tried searches on some of my colleagues and the results were even more difficult to fathom. The Advanced Search, where you can also include a company as well as a person’s name, ignored the company name. (I may have been clicking the wrong buttons or this feature may only work for PowerSearch accounts). Since I and most of my associates are running small businesses – probably not ZoomInfo’s forte – I persuaded some of my large, International corporate clients to try it out on people, companies and industries that they know. Their reactions ranged from laughter at the start, through disbelief at how wrong and out of date the data was, and finally to irritation and annoyance. I did look at some of the other services on offer, such as keyword searching for products and services and Job searches, but I still could not find any redeeming features that would persuade me to pay money for this service or to even use the free search. There are other sources and directories out there that are more reliable and up to date, and some of them free. Further information and programme of the event. Amit Agarwal has reported on a new version of Yahoo! called Yahoo! Alpha at http://au.alpha.yahoo.com. It has a minimalist home page, which has become de rigueur for search engines these days, and a single search box. The results page displays the usual list of web pages and on the right hand side you can opt to view results from Flickr, Yahoo Answers, YouTube, Yahoo News, Wikipedia and Sponsored links. In the top right hand corner there is an option to Customise this page that enables you to remove one or more of the resources and to add your own. I was initially intrigued by this but found it rather slow to respond and not as slick or responsive as Askx.com, which is testing out a similar approach to searching. Missing from both Askx and Yahoo Alpha is an obvious Advanced Search link. Both are in Beta and worth watching to see how they develop.